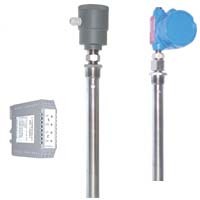 INTEMPCO LTX02 series 2-wire level transmitters are essentially LTX01 transmitters assembled with a concentric tube. As such LTX02 sensors can measure tank levels of liquids in metallic as well as non-metallic tanks. All other performance specifications are identical to LTX01 sensors. Level measurement of water based liquids in non-metallic tanks, using a FEP coated probe is an ideal application for the LTX02. To obtain a linear output in an irregularly shaped tank, such as a cone, use a concentric tube LTX02. For oils and mineral based liquids in non-metallic and metallic tanks use LTX02 with a bare SS316 probe. Make sure that the liquids are compatible with SS316 and PFA FEP materials. The LTX02 includes a standard 4-20mA loop powered LTX transmitter,a rugged customer selected enclosure, a rigid bare SS316 or FEP coated probe, concentric tube for ranges of up to 20 feet and a fitting. The LTX02 is designed for tanks which have fitting connections of 3/4 ” NPT or larger. Call factory for smaller tank openings or special applications. Water and water-based liquids in non-metallic tanks.